Brighten the look of any vinyl or plastic! 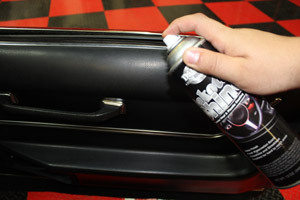 Dakota Shine Interior Vinyl & Plastic Coating is a grease-free, streak-free formula that provides an even layer of protection on your plastic and vinyl automotive surfaces. Dakota Shine Interior Vinyl & Plastic coating leaves a matte, satin finish without being sticky or tacky. Perfect for those hard to reach areas, Dakota Shine Interior Vinyl & Plastic Coating lets you spray and walk away with a freshly detailed interior! Dakota Shine Interior Vinyl & Plastic Coating provides a slick, satin finish to your interior plastic and vinyl surfaces. If you have dull and lifeless interior plastic and vinyl surfaces, Dakota Shine Interior Vinyl & Plastic Coating uses a non-foaming formula to brighten and enhance! 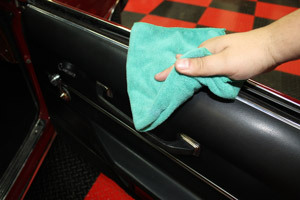 • Prepare surface by removing dirt, dust, oil, and grease. Dry surface. • Test spray on an inconspicuous area to check compatibility. Hold can 10 to 12 inches from the surface and apply using a stroking motion. It’s best to apply 1-2 light coats, than 1 heavy coat. • If desired, polish surface using a soft cloth after allowing to dry for a few minutes.